Image metamorphosis, or morphing for short, is commonly referred to as the animated transformation of one digital image to the other. It is a powerful tool and has widespread use for achieving special visual effect in the entertainment industry. The earliest attempts include Michael Jackson's famous MTV video, "Black or White", which really gave people some astonishment in 1980's. 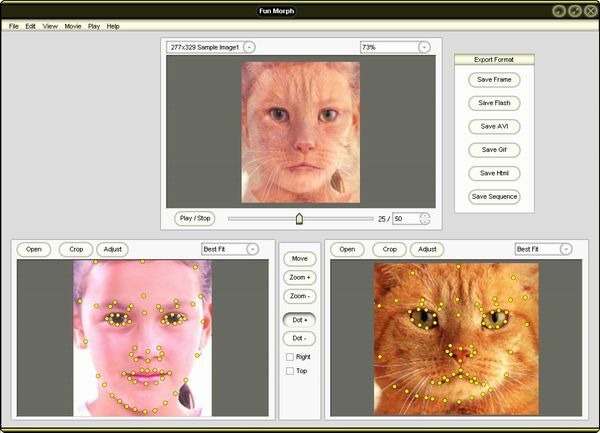 Basically, morphing is achieved by coupling image warping with color interpolation. As the morphing proceeds, the first image (source) is gradually distorted and is faded out, while the second image (target) starts out and is faded in. Thus, the early images in the sequence are much like the first image. The middle image of the sequence is the average of the first image distorted halfway towards the second one and the second image distorted halfway back towards the first one. The last images in the sequence are similar to the second one. Then, the whole process consists of warping two images so that they have the same "shape" and then cross dissolving the resulting images.